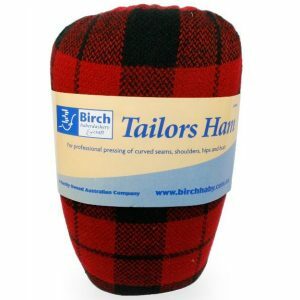 Tailors pressing mitt for perfect pressing of all body seams & curves in tailoring or dressmaking. Pressing Cloth: 27 x 90cm. Multipurpose chemically treated cotton. 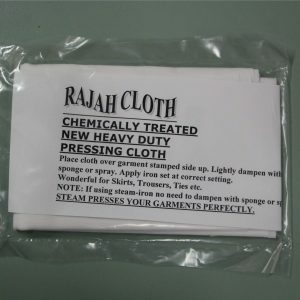 Use to steam press garments for a professional finish. An essential item to assist in your ironing and pressing. 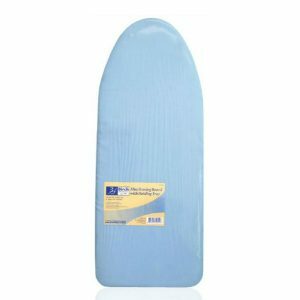 This ironing board is made from superior glide Teflon treated cotton. It is felt backed for a superiour iron and easy to fit with fastening tabs and drawstring elastic. It fits most standard sized ironing boards. 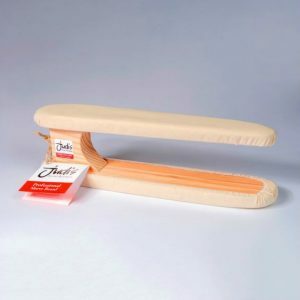 Mobile Ironing Board that fits over the table top and folds flat for easy storage. Also has a holding tray. 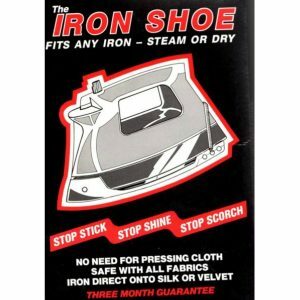 Stop stick, shine and scorch with the Iron Shoe. It fits any iron – steam or dry. No need for a pressing cloth. You can iron direct onto silk or velvet. The Iron Show has a 3 Month Guarantee. Place cloth over garment stamped side up. Lightly dampen with sponge or spray. Apply iron set at correct setting. 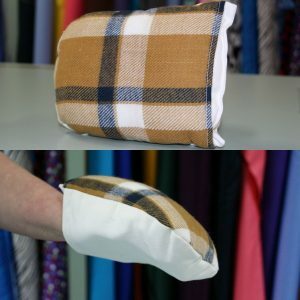 Wonderful for skirts, Trousers, Ties etc. Note: if using steam-iron, there is no need to dampen with sponge or spray with water. The steam presses your garments perfectly. 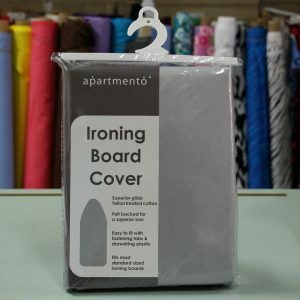 The sleeveboard is double sided with a slender, tapered side for narrow items and a blunt side ideal for larger pieces and ‘quick touch’ ironing jobs. 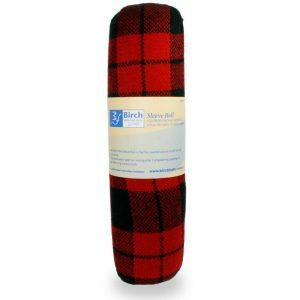 The sleeveboard is timber heavy duty construction with smooth-fit padded covers. 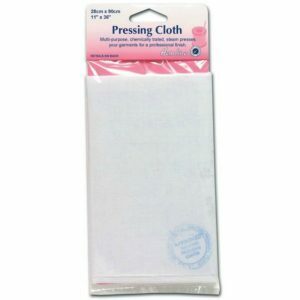 A must for tailoring sewing and general home pressing! 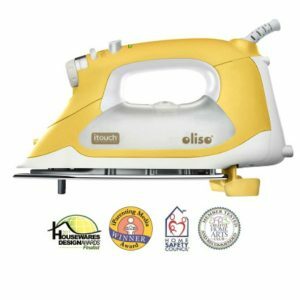 This Iron, with some absolutely fantastic features has been designed in USA especially for Quilters and Sewers. Ergonomic – no more repetitive lifting, iron levitates above the fabric and lowers with the simple touch of your hand. Ready when you are – iron stays on for 30 minutes before shutting off. Simply touch the handle to reactivate. Anti-drip system – prevents spitting and leaking while the iron is hot. Pro-Zone Soleplate – Extra flat pressing area eliminates dimple impressions in fabric. Beadblast chromium finish for unparalleled glide and scratch-resistance. OnePass Pressing – extra thick soleplate for optimal heat retention. Powerful vertical and horizontal steam removes the toughest wrinkles. Pointed Detailer Tip – creates crisp pleats, pockets,m cuffs and collars. Great for bias tape and tight corners. At this price – can you be without all these features for your everyday ironing? Instead of ironing being a chore, it will now be a pleasure!